Hangai argali hunt at one of our 5 different hunting areas, depend on scouting to which area to go to, 3000 feet altitude, terrain is usually rolling hills, drive and glass in the morning or late evening to find best ram, once find stalk on foot to shoot at usually 300 yards, average rams are 48”-52” with 18” base, 5 days hunt, camp will be Mongolian Ger with stove, bed, nicely decorated, food will be basic as beef, chicken, lamb, pork with various vegetables, bottled water, guide, interpreter, helper, cook, driver with hunting SUV, hunt available July 1st – September 30th, every year. Gobi argali hunt at one of our 2 different hunting areas, depend on scouting to which area to hunt, 2000 feet altitude, terrain is usually small Gobi hills, drive and glass in the morning or late evening to find best ram, once find stalk on foot to shoot at usually 300 yards, average rams are 45”-50” with 17” base, 5 days hunt, camp will be Mongolian Ger with stove, bed, nicely decorated, food will be basic as beef, chicken, lamb, pork with various vegetables, bottledwater, guide, interpreter, helper, cook, driver with hunting SUV, hunt available July 1st – September 30th, every year. Altai argali hunt at UVS province Sagil & Bukhmurun town area, borders Russia, which is “Gulzat” locally protected conservation area, has over 2000 argalis in 40km x 50 km mountain ranges, altitude up to 6500 feet, 300 plus rams, average rams are 53” with 20” base, best can be 55”, usually shot at 300 yards, 5 days hunt, camp will be Mongolian Ger with stove, bed, nicely decorated, food will be basic as beef, chicken, lamb, pork with various vegetables, bottled water, guide, interpreter, helper, cook, driver with hunting SUV, hunt available July 1st – September 30th, every year. 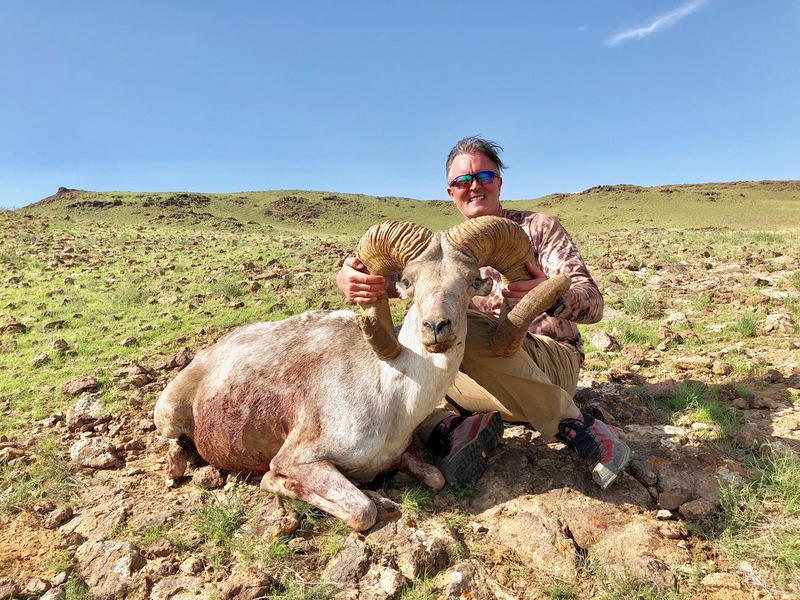 Altai argali hunt in BAYANULGII or KHOVD province, Higher Altai mountain ranges, altitude 6500 feet and up, 10 days hunt, average rams 57” x 20” base, special bigger trophy size rams can be organized specifically, usually shot at 300-500 yards, camp will be Mongolian Ger with stove, bed, nicely decorated, food will be basic as beef, chicken, lamb, pork with various vegetables, bottled water, guide, interpreter, helper, cook, driver with hunting SUV, hunt available July 1st – September 30th, every year. 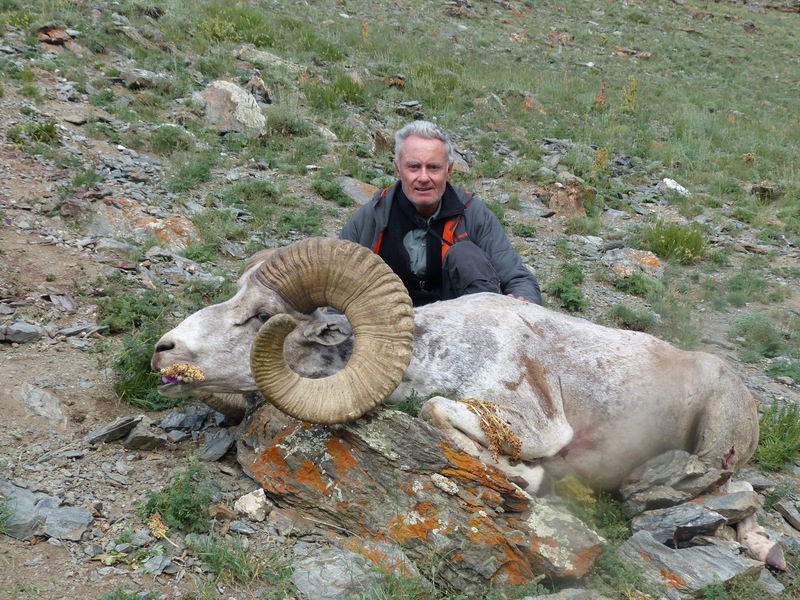 Altai argali hunt in BAYANULGII or KHOVD province, Higher Altai mountain ranges, altitude 6500 feet and up, 10 days hunt, special extensive scouted 60”+ horn size rams up to biggest possible, usually shot at 300-500 yards, camp will be Mongolian ger with stove, bed, nicely decorated, food will be basic as beef, chicken, lamb, pork with various vegetables, bottled water, guide, interpreter, helper, cook, driver with hunting SUV, hunt available July 1st – September 30th, every year. Price includes everything except domestic plane ticket ($300), international trophy shipment cost (around $500). 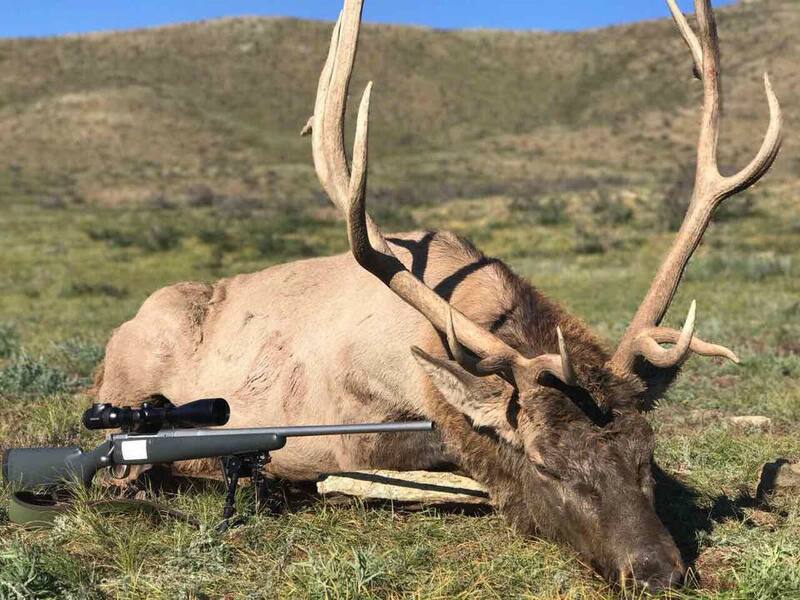 Altai ibex hunt at HOVD & GOBI-ALTAI province, 5 days hunt, higher altitude 8000 feet +, demands good physical ability, rocky mountains, hunts July 15th – October 15th, every year, average billies 40” and up, needs to shoot longer distance 300-600 yards, camp will be Mongolian Ger with stove, bed, nicely decorated, food will be basic as beef, chicken, lamb, pork with various vegetables, bottled water, guide, interpreter, helper, cook, driver with hunting SUV. Gobi ibexes are 35-40” on average and hunted same region as Altai ibex, but lower desert hills between Altai mountain ranges, 2 hours drive from Altai mountain ranges, usually 200 – 400 yards shot, needs to return to base camp every day, camp will be Mongolian ger with stove, bed, nicely decorated, food will be basic as beef, chicken, lamb, pork with various vegetables, bottled water, guide, interpreter, helper, cook, driver with hunting SUV. 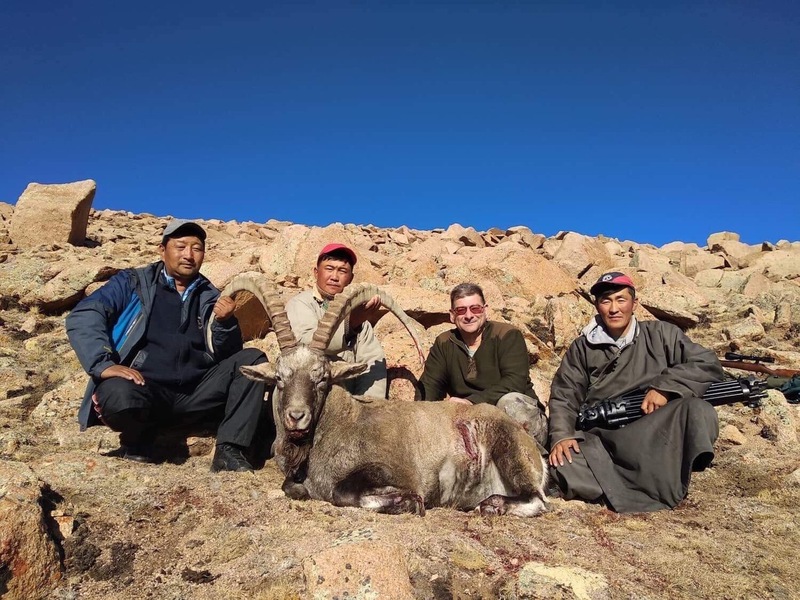 lower Gobi hills to hunt Gobi ibex and return to camp every day. Gazelle trophy fee is $1,500 and can be hunted at same area as Gobi & Hangay argali hunts. Wolf can be shot when encountered, trophy fee $500.